Social networking has been the center of controversial discussions and criticism since the concept was born. In her review of Facebook, titled “Face Value”, Mary L. Gray mentions that Facebook users will create bonds on a very loose basis, such as one common interest, and will therefore assume they know the person well enough to “Friend” them. This brings up another rather problematic aspect of Facebook: defriending. Or, when talking about Twitter, unfollowing. This concept has, in my opinion, changed how people, especially younger generations, manage their relationships. Since the birth of social networking, getting in touch with people has obviously become much easier. 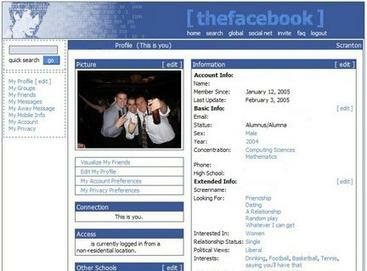 A Facebook user has nearly unlimited access to other profiles that can be friended or defriended. Creating ties with extended family or friends or even strangers around the globe has never been this simple. The frightening part is that cutting bonds with those you never want to be involved with again is also much easier. In fact, it is perhaps the most powerful and feared tool in social networking, as it provides no explanation to why you decided to unfriend or unfollow someone. The fact that it’s quick, easy, simple and doesn’t require you to come face to face with the person erases any guilt that might come along. It is also fundamentally different from deleting a person’s phone number, because some social networking sites will notify the user if someone decides to unfollow them. In short, it is a virtual slap on a person’s face, a wordless message that expresses disapproval or rejection. Moreover, social networking and Internet in general tremendously helps us forget that on the other side of the computer screen is another human being just like us. In other words, Facebook helps us reduce one person into a name written on our computer screen, a pixel object that can be deleted at any time we wish. It is tempting to forget that each day we are dealing with real people, because it makes defriending morally much more acceptable. But we forget far too often that the Internet is not a separate world, as Barry Wellman states in “Connecting Communities: Off and Online”, but is tightly connected with our real lives and the people around us and can greatly affect our future and our relationships. Whatever happens online will definitely have an impact on our daily lives outside social networks. At the same time, as we are encouraged to forget we are dealing with real humans, we are also seduced by Facebook into thinking we have solved whatever problem we were having by deleting a friend. We refuse to look deeper inside and think about the real issue in a relationship, because it is too much hassle and requires too much of our energy. Hence, we are not providing other human beings the respect, devotion and honesty they deserve, that we would most likely give them should we communicate with them face to face. These days, however, hectic everyday lives have caused us to forget the importance of true communication in a relationship and has turned it into a “chore” that Facebook helps us take care of, either by ignoring, blocking or unfriending. The 21st century has brought about many new interesting inventions. 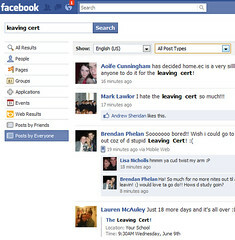 Information, friends, family and co-workers are closer than ever to us thanks to social networking. While the positive aspects have been tremendous, it can’t be ignored that the quickness and simplicity of Internet and Facebook have caused us to grow passive and impatient with our relationship management. Relationships are cut off and created on a whim without further thinking and consideration of what we are really doing, undermining the very meaning of friendship and family that once existed. This development is both frightening and alarming and it remains for us to see whether we can preserve our respect for other humans an our relationships even with the increasing development of social networks. The internet has, I believed, more or less crippled and degraded our sense of morality. Morality, I define as is our ability to predict and judge the outcomes of our actions either satisfying nor satisfying a predetermined or unseen result. In the physical reality that we inhabit, actions (most of the time) come with consequences, however good or bad they may be. An example would be “theft.” If you go into a CD store and steal a whole bunch, the scanner would detect the bar code attached to your CD and will go off, setting the security guards, and possibly the police into action. What about listening to a unofficial music video (one of those with still images, only streaming music) not provided by the artist him or herself, but rather uploaded by someone on youtube. What if you go one step further and download the full album from Piratebay. In all the examples, your essential outcome to be gained from the action is listening to the music. The wholly unique thing about the internet is that there are no consequences that come with your actions within the internet (yes the police can track your IP address and arrest you, but what are the chances). It is only action and result, nothing more, cut and dry. Although our society has tried to reinforce physical morality into the information age, it has no doubt had little to no effect, when it comes to regulating behavior on the internet that can call into question our physical moral perspectives, such as online piracy. Why has it had little effect? Because it was and is too late. The notion that the internet, the technology which drives our information age bends our physical moral perspective has become justified by mostly the users (and creators) of the internet. Maybe this is because the internet hasn’t had much time to mature yet, since it’s only been 60 years since the concept has been around and implemented. As the title of the post states, this is just a thought that has been in my mind for a while, and I do not have any resolution about this issue. However, I believe that both the creators and users of the technology must have absolute conviction, responsibility and belief to drive the moral standard of how the technology can be used. The digital divide is creating a huge loss of opportunities for those without Internet access. As we have learned in class, or in fact, as we have been currently enjoying benefits from our PCs and mobile phones, access to the Internet enables people to stay in touch with the latest information throughout the world. Exposure to cultures from other countries would affect peoples’ lives and ways of living. As we have learned, Internet access tends to be available only for residents of affluent countries, or to limited rich people in developing countries. The average citizen would be located on “the lower side” of the digital divide, unable to reach for latest news or cultures. To ensure all citizens high-speed Internet access, countries must possess enough budgets for investment. However, data indicate that the countries with a high percentage of Internet popularity tend to be affluent. Figures 1 shows the relationship between the percentage of individuals using the Internet (ICT, 2009) and the gross domestic product per capita (World Bank, 2009) of 204 countries worldwide. As seen in the figure, the more residents have access to the Internet, the higher GDP per capita a country holds. The correlation factor between them, which shows the relationship between the two factors, was 70.8%. 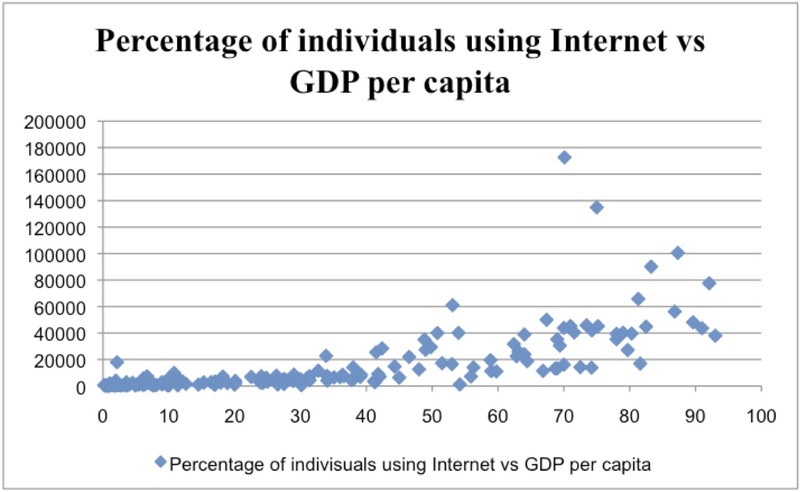 This means that there is a strong relationship between the Internet access and GDP per capita. It is said that same kind of link exists between the literacy rate and GDP per capita, but according to a calculation, its correlation factor is only 36.6%. This indicated that the effect of the digital divide is stronger than that of illiteracy. Establishing high-speed Internet access throughout a country is not an easy task. Developed skills and much investment would be required, which would be a tough burden for developing countries. What I am concerned about is that would lead to an even larger gap between the affluent countries and poor countries. Difference in economic power of the countries would enlarge the digital divide, which would make rich countries even richer. It is easy to predict that this relationship will lead to very unfair opportunity for people within developing countries. Supports to build high-speed Internet infrastructure and teaching Internet literacy would be very important. The data indicates that its importance is equal to or even higher than that of elementary education. Although relatively high cost will be required for technology investments, strong support is required to maintain equal opportunity for people on the other side of the digital divide. Throughout 2010 to2011, many people in Arabic countries gathered up and did social movements. This is called Arab Spring. Since long time ago, social movements were occurred a lot by protesters. However, Arab Spring was a bit different from former ones. Want was a difference is that many protesters uses social network service to get and spread information by using social network service such as Facebook and Twitter. Social network service is an online service and site that focuses on facilitating the building of social networks or social relations, real life connections, activities and so on. 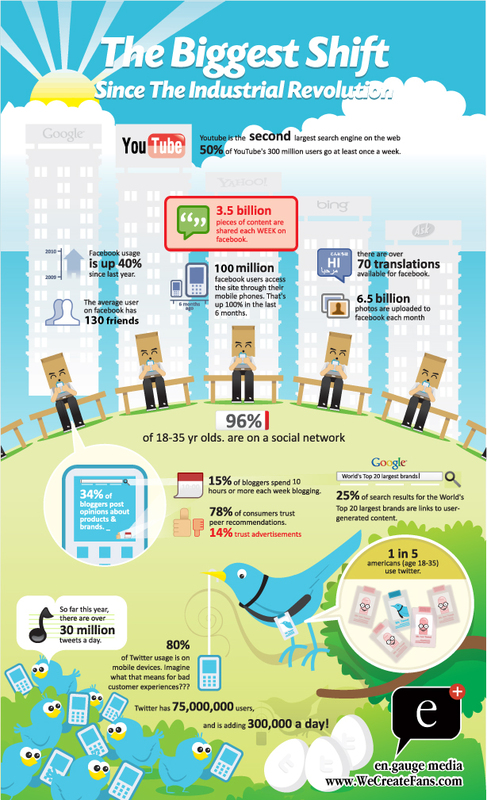 As spreading the Internet environment, the number of SNS users is increased. For instance, Facebook is strongly growing and reached over 1,000,000,000 users in October of 2012, compering to 600,000,000 users of January, 2011. Including me, users are able to write and post about what they think, pictures, links from other site and so on. Also users are able to share posts so that their friends are able to see my pots. If suppose am I post something like ‘Let’s do protest!’ or something like this on my Facebook page. If my friends like my post, push ‘Like’ to my post, and my friends’ friends will be able to see this. Then my post will spread to other people easily. In a case of Arab spring, according to statistics, about 80percent of Facebook users in Egypt and the republic of Tunisia used Facebook to get and spread information about social movements. As social movements getting extreme, the number of Facebook users was increased. Furthermore, this social network connected to networks in real-life, which mean people who didn’t use Facebook, also could get information rapidly from real life connections with Thor friends who used Facebook. Social network service is related to social movement deeply because it’s easy to spread information and emphasize. This situation makes people get involve in social movement much easier. This is one of reasons why many people could involve in Arab Spring. Social network service is working through the Internet, so sometimes it’s dangerous. There is a possibility that someone attacks your page with specific skills, or some information might be wrong. Thus, we have to be careful. However, as I mentioned in above paragraph, social network service has power. Young people are likely to use social network service than elderly people are. It’s getting much easier to make young people participate in social movements, and they may be going to be interested in society much more. Then the society will become much better. Moreover, in recent years, young people tend not to be involved in society very much. This is because young people don’t have interests in society even their generation will be coming soon. Or some of them try to change society with complaint. However, their voice is still small. I have many things to ask the government but people around me do not have interests. 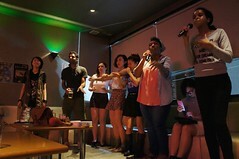 I hope young people, especially in Japan, will have much more power to change society like Arab Spring. And social network service is a good way to do it.